I am an avid reader of the What If? blog and one blog post that recently interested me greatly was the Sunset on the British Empire. During the 1980’s and 1990’s as series of laws were passed in the United Kingdom and many of the remaining British Colonies that marked the end of the British Empire. Whilst the British Empire did not ever formally end, the handover of Hong Kong back to China in 1997 is often regarded as the de facto end of the British Empire. There are a few paragraphs discussing these events in the "End Of Empire" section of the Wikipedia British Empire article. If the approximation is made that the BOT (British Overseas Territories) are analogous to the British Empire then it is possible to calculate if the sun ever sets on them. 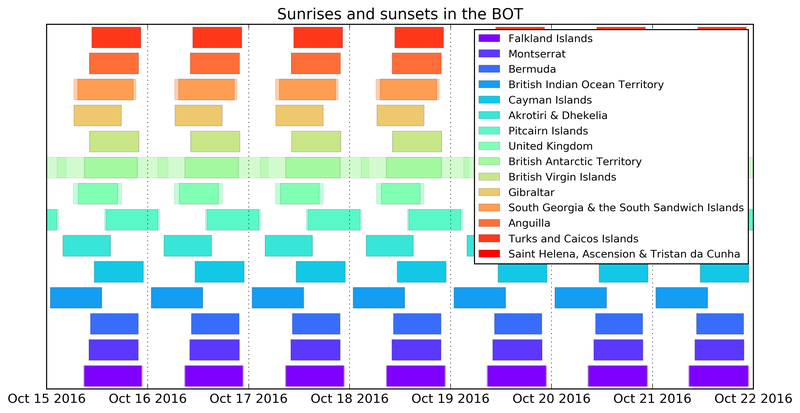 I decided to write a Python module to check the workings of the original blog post: BOTS (British Overseas Territories Sunsets). The module provides a wrapper function that first: identifies all of the BOT for the convenience of the user (as demonstrated for the Falkland Islands below); and second: plots the daylight hours for each BOT so that their overlap can be determined (as also demonstrated below). (Depending on the time of year chosen) the BAT (British Antarctic Territory) dominates the plot. Due to its location it is in daylight for half of the year on its own. As this particular quality is not that interesting (and given the unusual legal status of territorial claims on Antarctica) the BAT will be ignored for the rest of this discussion. Each territory has a solid and a translucent extent: the solid extent is when there is daylight for the entire territory; and the translucent extent is when there is daylight for only part of the territory. This occurs because the sun sets and rises at different times on the east and west coast of any piece of land. At most times during the day there are many locations that experience daylight, however, there are two periods when the sun shines on only one territory: the BIOT (British Indian Ocean Territory) and the Pitcairn Islands. Should either of these two territories cease to be British then that would be the end of the sunshine.